Hello. I work in Algorithmic Trading at Two Sigma. 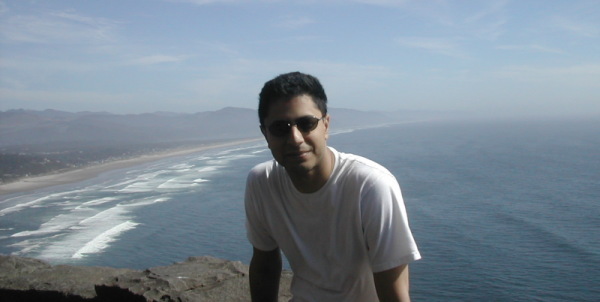 Previously, I was a researcher at the Strategic CAD Labs at Intel in Hillsboro, Oregon. At Intel I worked on high-level modeling and verification of communication protocols and on the synthesis of communication fabrics. Before joining Intel, I was a Ph.D. student in Computer Science at Berkeley working with Prof. Robert Brayton and Alan Mishchenko on logic synthesis and verification. And before Berkeley, I spent a lovely five years at the Indian Institute of Technology at Bombay. The copyright for some of these documents belongs to IEEE, ACM or Springer. They are posted here for your personal use and may not be redistributed. S. Chatterjee, M. Kishinevsky and U.Y. Ogras. Quick Formal Modeling of Communication Fabrics to Enable Verification. In IEEE Design and Test of Computers, vol. 29(3), June 2012, pages 80-88. S. Chatterjee and M. Kishinevsky. Automatic Generation of Inductive Invariants from High-Level Microarchitectural Models of Communication Fabrics. In Formal Methods in System Design, vol. 40(2), April 2012, pages 147-169. C.-L. Chou, R. Marculescu, U.Y. Ogras, S. Chatterjee, M. Kishinevsky and D. Loukianov. System interconnect design exploration for embedded MPSoCs. In Proc. SLIP '11, pages 1-8. A. Gotmanov, S. Chatterjee and M. Kishinevsky. Verifying Deadlock-Freedom of Communication Fabrics. In Proc. VMCAI '11, pages 214-231. S. Chatterjee and M. Kishinevsky. Automatic Generation of Inductive Invariants from High-Level Microarchitectural Models of Communication Fabrics. In Proc. CAV '10, pages 321-338. Superseded by 2012 journal version. S. Chatterjee, M. Kishinevsky and U.Y. Ogras. Quick Formal Modeling of Communication Fabrics to Enable Verification. In Proc. HLDVT '10, pages 42-49. Superseded by 2012 journal version. N. Nikitin, S. Chatterjee, J. Cortadella, M. Kishinevsky, U.Y. Ogras. Physical-Aware Link Allocation and Route Assignment for Chip Multiprocessing. In Proc. NOCS '10, pages 125-134. A. Mishchenko, S. Chatterjee, R. Brayton. Boolean factoring and decomposition in logic networks. In Proc. ICCAD '08, pages 38-44. A. Mishchenko, S. Cho, S. Chatterjee, and R. Brayton. Combinational and sequential mapping with priority cuts. In Proc. ICCAD '07, pages 354-361. S. Chatterjee. On Algorithms for Technology Mapping. PhD Thesis, University of California at Berkeley, 2007. S. Chatterjee, A. Mishchenko, R. Brayton, and A. Kuehlmann. On resolution proofs for combinational equivalence. In Proc. DAC '07, pages 600-605. S. Chatterjee, Z. Wei, A. Mishchenko, and R. Brayton. A linear time algorithm for optimum tree placement. In Proc. IWLS '07, pages 336-342. A. Mishchenko, S. Chatterjee, and R. Brayton. Improvements to technology mapping for LUT-based FPGAs. In IEEE TCAD, vol. 26(2), Feb 2007, pages 240-253. S. Chatterjee, A. Mishchenko, R. Brayton, X. Wang, and T. Kam. Reducing structural bias in technology mapping. In IEEE Trans. CAD, vol. 25(12), December 2006, pages 2894-2903. S. Chatterjee, A. Mishchenko, and R. Brayton. Factor cuts. In Proc. ICCAD '06, pages 143-150. A. Mishchenko, S. Chatterjee, R. Brayton, and N. Een. Improvements to combinational equivalence checking. In Proc. ICCAD '06, pages 836-843. A. Mishchenko, S. Chatterjee, and R. Brayton. DAG-aware AIG rewriting: A fresh look at combinational logic synthesis. In Proc. DAC '06, pages 532-536. A. Mishchenko, S. Chatterjee, and R. Brayton. Improvements to technology mapping for LUT-based FPGAs. In Proc. FPGA '06, pages 41-49. S. Chatterjee, A. Mishchenko, R. Brayton, X. Wang, and T. Kam. Reducing structural bias in technology mapping. In Proc. ICCAD '05, pages 518-525. S. Chatterjee and R. Brayton. A new incremental placement algorithm and its application to congestion-aware divisor extraction. In Proc. ICCAD `04, pages 541-548.